I have a love-hate relationship with brunch. I love brunch but I hate the lines. 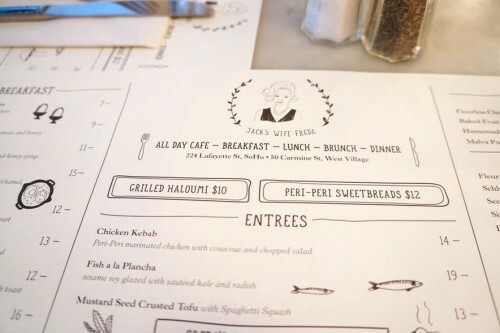 Most brunch-only restaurants don’t take reservations and if they are worth checking out, you’ll most likely find yourself waiting in line for an hour plus during prime brunch hours which is typically the case at Jack’s Wife Freda. But since we were flying out on a Monday morning, we were able to avoid the crowd. We arrived at 8:30am when they opened and were seated immediately. Soon afterwards, the restaurant began to fill up and as we left, I’d say the space was about half full. Busier than you’d expect on a weekday morning! It’s an interesting demographic with customers from all different age groups. We saw groups of young University-aged students, older couples and even a family with several young children in tow. 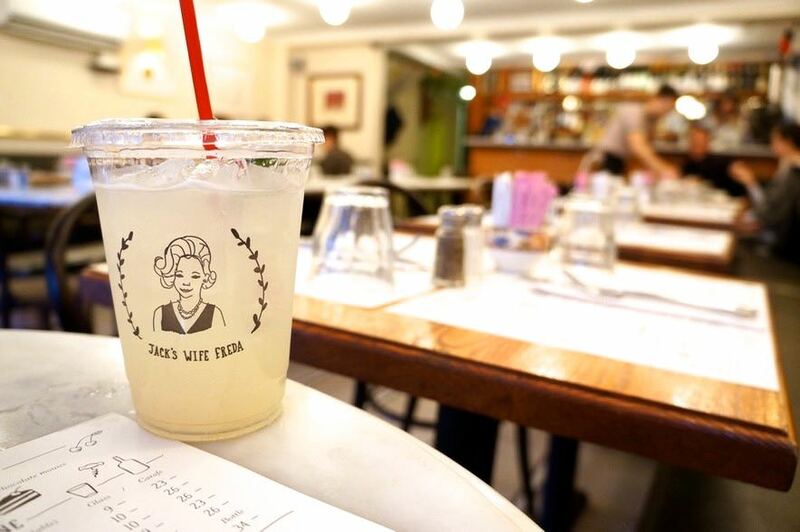 Jack’s Wife Freda has a very casual feel to it with tightly-packed tables and dark green banquettes. It’s a good thing we dined here during off-peak hours – I’m not sure the space would’ve been able to accommodate our two carry-on’s otherwise! I should mention that we dined at the original Soho location on Lafayette which is open every day for breakfast, lunch and dinner. Their second location is on Carmine in West Village. We walked by the West Village location and from what I remember, the aesthetic is quite similar. According to their website, the restaurant is described as a “lively all-day bistro executing American-Mediterranean cooking & classic cocktails in understated digs” and is brought to us by the husband and wife team Dean and Maya Jankelowitz who met while working at Balthazaar. Jack’s Wife Freda, named after Dean’s grandparents, serves up food that is a reflection of their backgrounds (Israeli and South African) and family histories. For breakfast, prices range from $7 for soft boiled eggs with challah to $21 for Jack’s Breakfast which includes 2 eggs, grilled skirt steak, grilled tomato, fingerling potatoes and sourdough. The breakfast/lunch menu also offers salads ($13-$15), entrees like chicken kebabs and fish a la plancha ($13 to $19), sandwiches ($11-$16) and a selection of desserts for $8 each. Dinner features a separate menu. Since it was 8:30 in the morning, I opted for a non-alcoholic beverage, the Mint Lemonade ($5) which was super refreshing. They also offer fresh cantaloupe juice which I’ve read great things about. I’m just not a huge fan of cantaloupe. 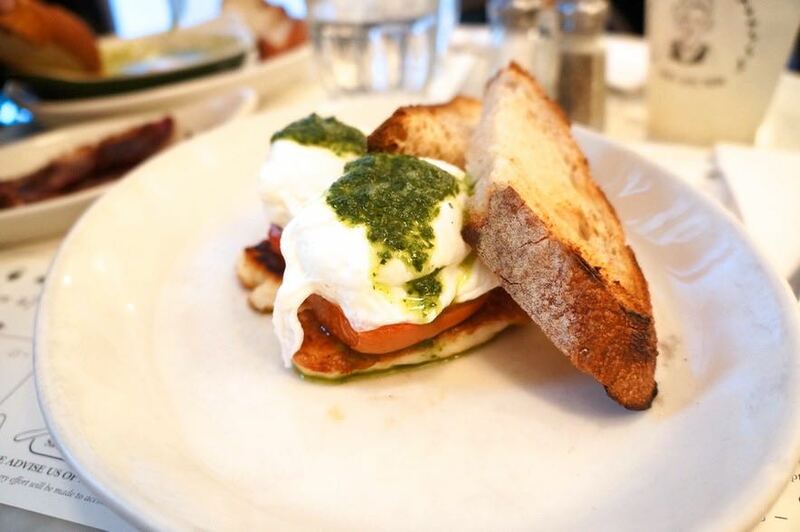 I ordered the Poached Eggs with Grilled Tomato and Haloumi – served with sourdough toast ($12). I love haloumi and wish more restaurants would serve it. It’s a very mild cheese which has a chewy texture to it. Since it’s a pretty rubbery cheese, it lends itself nicely to being grilled. I’ve never actually eaten it uncooked before but I imagine the texture wouldn’t be as enjoyable. The haloumi added a nice brininess to the dish which also consisted of perfectly poached eggs and meaty slices of tomatoes on toast. A really delicious dish! The only downside is the portion size. It’s not a very large dish so if you have a large appetite, you’ll probably need to supplement this dish with something else. 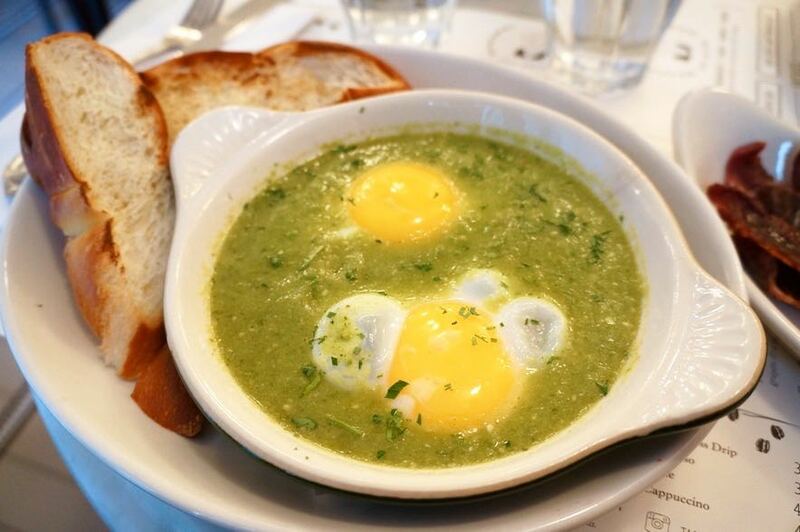 Mike ordered the Green Shakshuka – 2 baked eggs in a green shakshuka served with challah toast ($12). This famous dish is talked about in nearly every review so there was no way we could eat here without giving it a try. Shakshuka typically consists of poached eggs in a red tomato and pepper stew. The version here consists of a tomatillo and green pepper base instead, making it a ‘green’ shakshuka. It tasted much lighter and was more watery than I expected. Taste-wise, it wasn’t anything memorable in my opinion – not bad but not great either. Mike enjoyed it more than I did but agreed that the traditional tomato-based shakshuka is preferred. 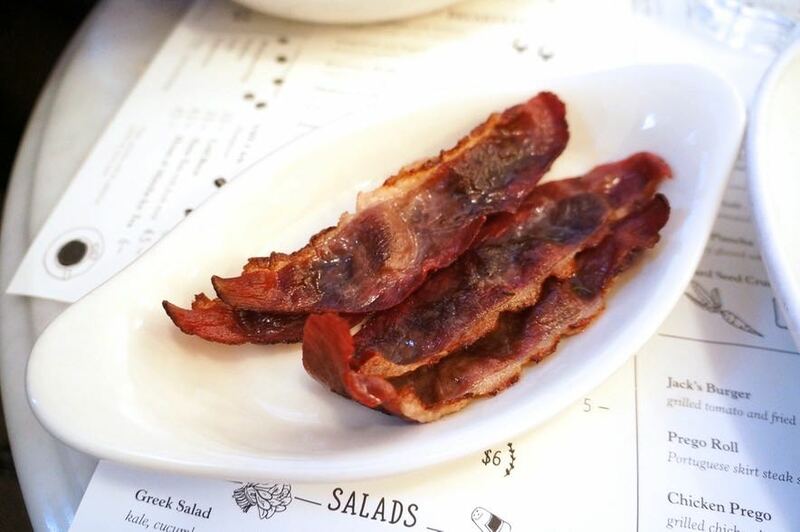 In addition to the haloumi and shakshuka, we also ordered a side of House Cured Duck Bacon ($6). It’s a little pricey for four pieces but it was a great addition to our otherwise meatless meal. It didn’t taste gamey and was actually quite similar to regular pork bacon. Overall, we had a nice experience at Jack’s Wife Freda but it’s a little overhyped in my opinion. Bottom line, I’d gladly eat here again if I didn’t have to wait in line but I don’t think it’s worth waiting 1+ hours for.